Thirteen doinas and seventeen kale bazetsns transcribed and edited by Cookie Segelstein and Joshua Horowitz, most for the first time in print. From well known Jewish kale bazetsns to Romanian doinas taken from field recordings, this collection includes a thorough introduction by Horowitz, and a discography of sources. The Music of Veretski Pass is a companion book for the first recording made by the trio of the same name. Most of the music here appears for the first time in print. 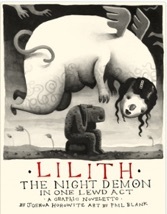 Order the richly illustrated, annotated libretto for Lilith, The Night Demon. This is an epub version (Kindle version on Amazon coming soon).